At Hafod-Y-Bryn we will ensure that your dog feels secure in our care, we aim to provide a stimulating environment where there are plenty of opportunities to play, exercise and have a bit of a rest, so whilst you are away your dog will live a peaceful life. We will provide personal loving care and attention throughout your dog’s stay, just like they will get at home; we even have the radio on during the day for the added feel of home. 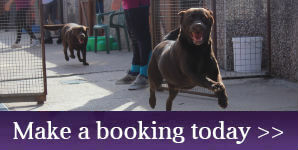 We have a range of accommodation options available, from standard single kennels to family kennels to suit up to 3 dogs. We also have a quiet block for the nervous boarders or to suit our more elderly guests. We should be able to accommodate all your kennel requirements so just ask the question and we will be sure to have an answer! Our accommodation includes a secluded bed area with either under floor heat pads or a heat lamp for those cold days and nights and an exercise area where your dog can see other dogs, or if you prefer, we have kennels with exercise areas boasting higher walls so they are more secluded. We encourage you to bring your dog’s favourite toys and treats, please be assured that we do not share your dog’s personal toys with any of our other boarders. All bedding and baskets are provided, however if your think your dog will settle with their own basket and bedding then please bring them along. We believe that a well exercised and stimulated dog is a happy dog, so our guests are exercised three times a day. Each dog’s individual needs are taken care off, some just like to mooch around but others just want to play ball and run, run, run! So our team of carers will ensure that your dog recieves the exercise they want. All major brands of tinned and dried food are always available and our dogs are fed twice daily, morning and evening. We endeavour to treat all of our guests as their individual needs require, this includes maintaining any special dietary requirements. Treats will be offered to dogs during the day (if allowed), as it helps with the process of us befriending your dog and gaining their trust. Guests are welcome to bring their own treats or special food, and we will make sure that you dog receives these as you wish. All the above are routine vaccines administrated at your vets. Vaccinations should be boosted annually, PLEASE ENSURE THAT YOU BRING YOUR VACCINATION CERTIFICATE WITH YOU AND RECORDS OF ANNUAL BOOSTERS. A vaccination against kennel cough is recommended but not essential for boarding at Hafod Y Bryn, all kennel cough vaccinations should be done at lease 3 weeks prior to arrival. For new customers we recommend that you come and visit us prior to making a booking to enable you to ask us questions and to ensure that our environment and atmosphere will suit your dog. Please feel free to contact us whilst you are away to enquire about how your dog is settling in, we don’t mind and will even text you photos if you desire. We are also happy to administer medication to your dog whilst they are in our care. Please advise our staff when making a booking.